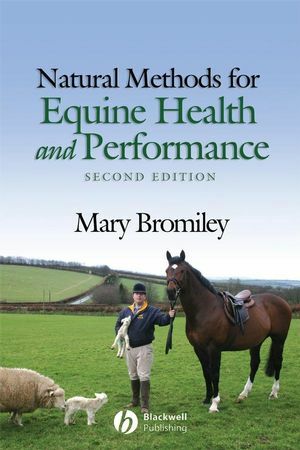 Natural Methods for Equine Health and Performance, Second Edition, presents a concise overview of a natural approach to horse care and management for the 21st century. Mary Bromiley has an excellent reputation for achieving results using natural methods for muscle re-education. This book will be useful to anyone who owns or routinely works with horses. Provides advice on natural horsemanship, contrasting the natural and domestic habitats. Covers a range of holistic methods of treatment, including acupuncture, massage, herbalism and homeopathy. Discusses developmental interaction between a horse and humans. Contains expanded coverage of physical development and nutritional requirements. School improve a horse’s flexibility and performance. Mary Bromiley is a Chartered and Veterinary Physiotherapist. In 1984 she founded, with her daughters Penny and Rabbit Slattery, the Downs House Equine Rehabilitation Centre, a world first for the treatment and rehabilitation of both horse and rider. She has written six books, and has been published internationally in six languages. She lectures worldwide and for 18 years travelled as therapist to the medal winning New Zealand 3 day event team. 1 What is Natural Horsemanship. 4 Health Maintenance and Healing. Part III Training/ building the horse. 1 Terminology Associated with Muscle Activity. 3 Appendicular Skeleton, the Levers. 1 The Classical Training approach. Part V Overview of Training. 3 General Considerations for the Rider. 1 Progressive Muscle Loading I: Gymnastic Apparatus. 3 Progressive Muscle Loading II: The Addition of Skills. General Summary. The fundamentals of Natural Training and Husbandry. Appendix II Athletic Horse versus Athletic Man. Appendix III Natural Health Maintenance in the New Age Horse. New edition of the classic book on the subject.